This project is a pictorial documentary of the current status of Puerto Rico's traditional architectural heritage which includes Spanish Colonial , Neoclassical , Medieval and Baroque styles of architecture. The strong Spanish influence of Puerto Rico's history is evident in the massive military fortresses and structures built by the Spanish Royal Corps of Engineers during the Spanish rule (1493-1898) pictured in the first gallery below. The first gallery below include pictures of El Morro Fortress (1587), Fort San Cristobal (1783), Fort San Geronimo , The Battery of El Escambron and La Fortaleza , which although today is the residence of the island's governor, was originally built as a military fortification. All were built during the Spanish rule of the island to protect the Capital City of San Juan from invaders. The Castle of San Felipe del Morro, named in honor of King Phillip II, is a massive six level 16th-century citadel built between 1540 and 1589. Rising 140 feet above the sea, its 18-foot-thick wall proved a formidable defense, it fell only once in 1598 to a land assault by the Earl of Cumberland's forces. Most of the walls in the fort today were added between the 1760-1780's. The fort is a maze of tunnels, dungeons, barracks, outposts and ramps studded with small, circular sentry boxes or garitas. The 74 acre area, the largest fortification in the Caribbean, was designated a National Historic Site in February 1949 and is administered by the National Park Service. In 1992, in honor of the 500th anniversary of the discovery of Puerto Rico by Christopher Columbus, the fortress was restored to its historical architectural grace and beauty. Construction of Fort San Cristóbal as El Morro's partner in the city's defense on the opposite end of San Juan began in 1634 and was completed in 1771. It is supported by a massive system of outworks which provided defense in depth and is one of the largest defenses ever built in the Americas. It rises 150 feet above sea level and covers 27 acres of land. As if its size and height weren't sufficient to intimidate enemies, its intricate modular design was sure to foil them. A strategic masterpiece, it features five independent units, each connected by moat and tunnel; each fully self-sufficient should the others fall. It's a World Heritage and National Historic Site, administered by the U.S. National Park Service. La Fortaleza or the Palace of Santa Catalina was authorized by Charles V and built between 1533 and 1540 as a fortress for defense against Carib Indian attacks. The building was the first of a series of military facilities constructed in the Bay of San Juan, but soon later proved inadequate to guard the entrance to the harbor and became the official Governor's Residence, today, the oldest governor's mansion still used as such in the Western Hemisphere. It has been occupied twice by invaders; by the Earl of Cumberland in 1598 and by the Dutch General Bowdoin Hendrick in 1625 when the building was damaged by fire. A major reconstruction was undertaken in 1640. In 1846, the building was remodeled and given a palatial aspect, uniting harmoniously 16th century military architecture with the refinements of the 19th century. 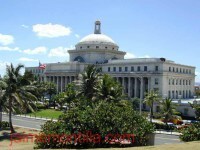 It has been the home of 170 governors of Puerto Rico and is the official residence of the current governor. Although the original structure (Palatial Building surrounded by gardens) was very primitive, La Fortaleza has undergone numerous changes over its 400 years of history. The Escambrón Battery is a small fortification located at the eastern tip of El Escambrón Beach in the Tercer Milenio Park. It is not as old as the other San Juan fortifications as it was built at the end of the 18th century, but it was an integral part of the line of defense of San Juan and served as a shooting practice place for the Spanish army. The Escambrón Battery is not part of the San Juan National Historic Sites. San Gerónimo Fort is a small fort of the line of defense of San Juan that was built to replace a small fortification that was destroyed during the 1598 attack led by George Clifford. It is located in the Puerta de Tierra neighborhood at the entrance of the Condado Lagoon, just behind the Caribe Hilton Hotel. Its location allowed for the fort to protect the entrance to the lagoon and to block access to the San Juan islet from the east. San Gerónimo Fort played an important role in defending San Juan during the attacks by the Englishmen and the Dutch. Even though it suffered a lot of damage in every attack, it was always restored and improved. The second gallery below is of street scenes and structures in and around Old San Juan , mostly built in the 19th and early 20th Centuries. 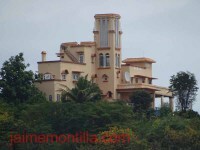 The third gallery is of 19th and early 20th Century structures designed by noted Puerto RIcan architects . A separate page is dedicated to the work of Czech born, US trained and PR resident, Antonin Nechodoma due to his introduction, primary and probably only exponent of the Prairie Style of Architecture in Puerto Rico and the controversy surrounding his work. The next gallery is of streets, views and structures other than military fortifications in and around Old San Juan. The structures herein are mainly built during the Spanish rule days although some were built shortly after the US occupation in 1898. One of the pictures is the tomb of Wencesalo Borda Rueda of whom you can read more in the Trapiches Project , Central Canovanas and La Esperanza pages. Pedro Mendez Mercado, is credited as being the most notable promoter of the Art Deco style in Puerto Rico, a style not widely seen throughout the island. 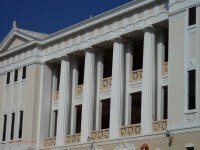 His most notable work include the actual façade of the old Ponce marketplace and the Miami Building in San Juan’s Condado district. Raul Reichard (1908-1996) received his Architect degree from the University of Michigan in Ann Arbor. In 1933 started working for the PR Economic Reconstruction Administration (PRERA) which at the time was directed by Rafael Carmoega, where he worked in some of the designs of the University of PR. His best known work was in 1939 when Rafael Benitez Rexach commissioned him to design the Normandie Hotel .